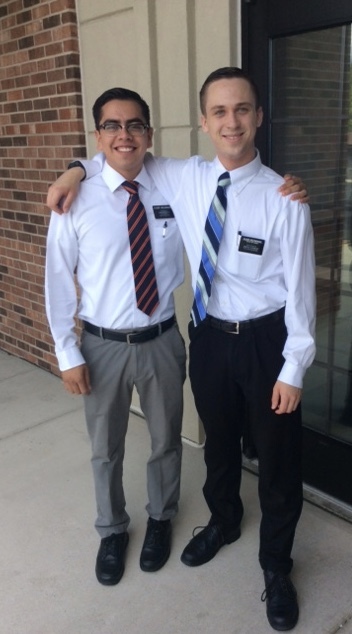 New York NY: Awesome New Missionaries! We held the new missionary meeting in Scarsdale on Friday. President Smith teaches the Doctrine of Christ, which is simply Faith, Repentance, Baptism, The Gift of the Holy Ghost and Enduring to the End. It is always awesome and insightful. The missionaries have so many great comments and thoughts that they share. "and we have entered into their houses and taught them, and we have taught them in their streets; yea, and we have taught them upon their hills; and we have also entered into their temples and their synagogues and taught them; and we have been cast out, and mocked, and spit upon, and smote upon our cheeks; and we have been stoned, and taken and bound with strong cords, and cast into prison; and through the power and wisdom of God we have been delivered again." Wow! How can we ever say we are having a bad day! would be full if perhaps we could be the means of saving some." that comes from sharing the gospel and bringing someone to Christ. my JOY is full, yea, my heart is brim with JOY, and I will rejoice in my God. in this land, for which we will praise his name forever." 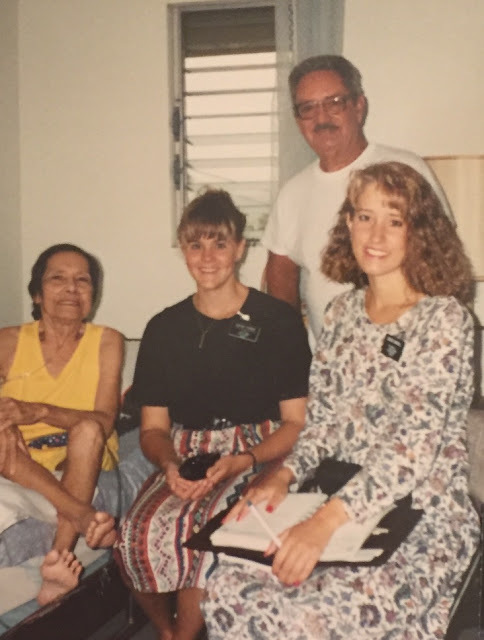 I was blessed in 1992 to meet Bill and Margaret Perez. Margaret was very ill with emphysema due to years of smoking. She was so frail, yet had a giant spirit and eagerly grasped the truths of the gospel. Shortly after my arrival in Hawaii she was baptized. We continued to teach her sweet husband, who spent most of his time attending to her every need. He was so humble yet was struggling to understand the principles of the gospel. We invited him to read the Book of Mormon and to pray. We fasted for him, prayed for him and sought the Lords will concerning him. Margaret pleaded with the Lord to help her husband understand and accept the gospel. During the course of 5 months we taught him every week. One week before I was transferred Bill Perez entered the waters of baptism. My JOY was full!...so I thought. 1 week before I completed my 18 month mission Bill and Margaret Perez were sealed in the Laie Hawaii Temple. This time my JOY was full! There is nothing better than that. Witnessing them making covenants and becoming an eternal family was the crowning point of my service in Hawaii. I don't know why I was blessed to teach Bill and Margaret Perez. It changed me. I am so grateful for the privilege of sharing the gospel with them and helping to bring the JOY and peace into their lives that the gospel brings. I shared with the missionaries that this is "my story". What will "their story" be? Ammon goes on to say "Now behold we can look forth and see the fruits of our labors; and are they few? I say unto you, Nay, they are many..."
As we look at experiences in hindsight we can easily connect the dots of why certain things happen. Looking ahead we do not always know the "why" or what is going to happen. I do know the Lord blesses us as we go forth with faith and trust in him. He makes so much more out of our lives than we ever can on our own. I have also found that serving the Lord is JOYFUL! Thanks to Sister Honeycutt, Sister Miles and the Youngs for the yummy lunch! Thank you Sister Smith for your wonderful story!